In this stylistically daring look at the devastating ivory trade in India, author Tania James provides a broad look at all the factors involved in this gory business while keeping her focus on the individual, the small, the personal. To develop her broad message within a manageable focus, she creates three unique stories which evolve simultaneously – the third-person story of the Gravedigger, a lone elephant without a herd and without the grounding in elephant lore which young elephants need to survive; the story of the Poacher, involved in the lucrative ivory trade, told by his younger brother Manu, who is naïve regarding his brother’s motivations; and the story of the Film-maker, in which cinematographer Emma Lewis describes her efforts to document the work of Dr. Ravi Varma, the head veterinarian of the Kavanar Wildlife Park, who works to rescue and rehabilitate orphaned elephant calves. The three separate points of view provide unusual depth to the examination of poaching without leading to didacticism and preachiness. By rotating the focus among these points of view, the author keeps the suspense high, constantly adding new information to each individual story while leaving other mysteries about the Gravedigger, the Poacher, and the Film-maker undeveloped till the end. As a young elephant, the Gravedigger walks with his herd along the traditional woodland trails which India’s Forest Department will eventually cut into foot trails of their own. His mother has recently had another calf, and his own protected place, under her belly, is now occupied by a new baby, leaving him with only a tail to grab onto when he needs her. The herd includes an old tusker and a twelve-year-old whose tusks are only beginning – just stumps, at this point. Their understanding of poaching is already so ingrained in their cultural experience that whenever they scent a man in the forest, the cows crowd around the two tuskers, their rumps facing outward to protect the tuskers from harm. On one day when the wind is not strong enough to carry the scent, this small herd is attacked, and the elephant who becomes the Gravedigger is suddenly orphaned. A chain tree by D. Nambiar. Early in the novel, the author presents the legend of a boy who guided a British engineer who was cutting a road through the mountains. The man later shot his young guide, whose restless spirit took residence in a banyan tree. Only when the tree was wrapped in chains was the boy's spirit contained, leading to the naming of the Chain Tree. 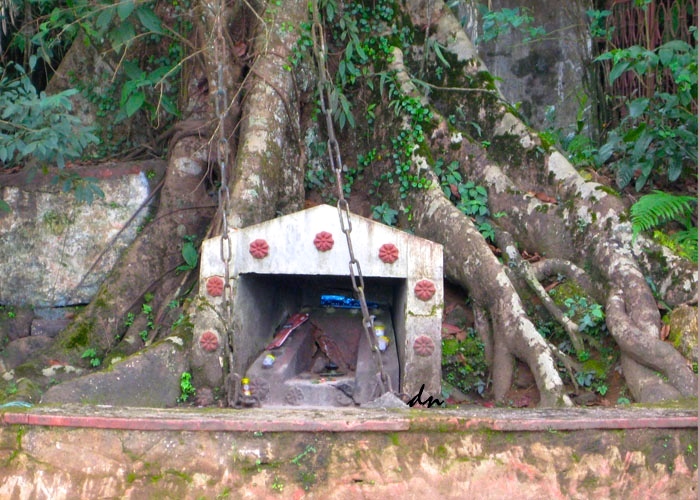 Here the chains are visible in front of the niche. Manu, the brother of the Poacher, the second point of view, is a young teen as these narrative sections begin, and he and his young cousin Raghu, sometimes stay overnight in the palli, a primitive hut on stilts in their rice field, which overlooks the Kavanar Wildlife Park where the Gravedigger lives. Their job is to keep an eye on the field during the night and to send up an alarm if an elephant threatens it. Raghu is particularly interested in the stories he has heard about Dr. Ravi Varma, the veterinarian at the nearby wildlife park, who is said to have successfully reintroduced a calf to its mother in such a way that the elephant took her calf back, an almost unheard of success. One night, however, when Manu is supposed to stay in the palli with Raghu, Manu is exhausted, having worked in the fields all day. Not incidentally, he also has a girlfriend. When he fails to show up that night, disaster results. Manu rightly blames himself for the outcome, so he feels obligated when his uncle, Raghu’s father, offers the compensation he will get from the Forest Department if Manu and his brother Jayan, recently released from prison, will kill the elephant who attacked Raghu. 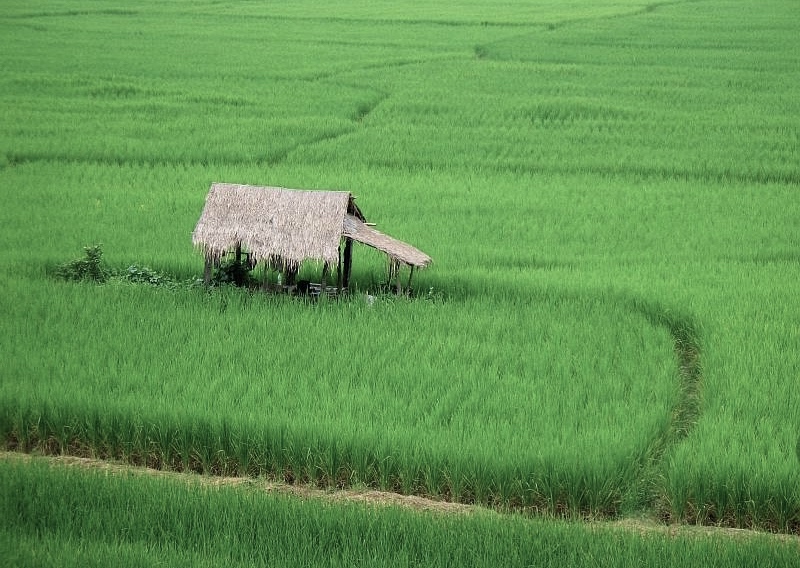 A palli in a rice field. The point of view of Emma Lewis, the Film-maker, conveys some of the economic complications which inspire a group of the villagers who live near the wildlife center to resort to poaching. The Forest Department has subsidized a private timber company and given permission for them to cut timber on lands the villagers have been using for years, and they are enraged. These lands have officially belonged to the Forest Department ever since they were “inherited from the British Raj, who had previously claimed all forestlands for the queen,” but the villagers have been harvesting firewood and honey there “long before Queen Victoria was in diapers.” The tension is high and the attitude toward the Forest Department is at a low. To add to the complications, an unnecessary and distracting love story takes the emphasis off the real issues in these Film-maker sections (though it makes the characters feel a bit more human). 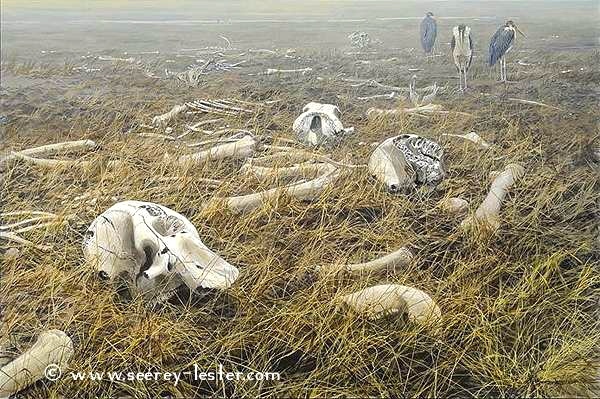 "Elephant Graveyard," painted by John Seerey-Lester. Reprinted by permission of the artist. See photo credits for further information. Each of these stories continues to develop during the novel, adding new information gradually and not necessarily in chronological order. Working for the Old Man who has trained him after his mother’s death, The Gravedigger is in chains twice a day when he must perform for tourists, though he escapes every night in his dreams. Fascinating stories of elephant lore, such as how the elephant got its tusks, and how a boy turned into an elephant emerge, add depth to the novel, and the vision of the elephant graveyard becomes a major symbol. Eventually, the Gravedigger endures torture by one of his keepers, whose behavior recalls some of the Gravedigger’s still vividly traumatic childhood memories, and the novel works its way to its climax. Beautiful passages of natural beauty contrast with descriptions of the horrors of human contact to bring the novel to its conclusion. A Flamboyant Gulmohar tree stands guard outside the Range Forest Office. 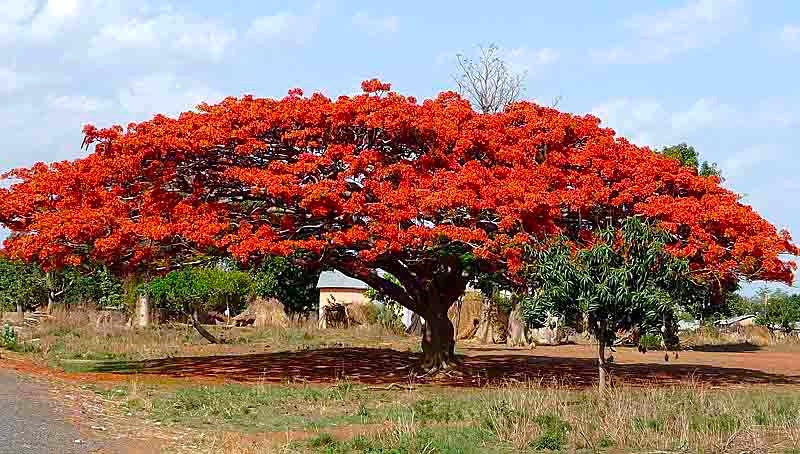 In the US this is called a Royal Poinciana tree. 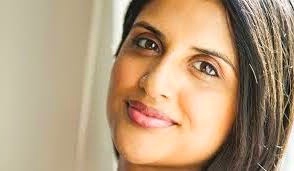 Author Tania James walks a fine line here as she develops a story filled with unexpected twists and turns. 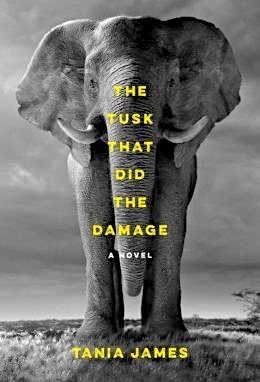 She wisely avoids the problems of trying to recreate an elephant’s point of view by telling the elephant’s story in the third person and in short paragraphs of realistic detail. Brief sentences in a straightforward subject-verb-object sentence pattern reflect the point of view of an objective observer who is young – like the elephant – but the observations are trenchant, crucial to the development of the novel. The Poacher sections reflect both the thoughts of Manu, the younger brother of Jayan, and Manu’s innocence of what older brother Jayan has been doing, which makes Jayan’s behavior a personal betrayal. The Film-maker sections present narrative commentary and provide transitions among the various points of view in the total story. This is an imaginative presentation of the issue of poaching and ivory sales and the damage done to the environment and its integrity for all species, both human and animal.